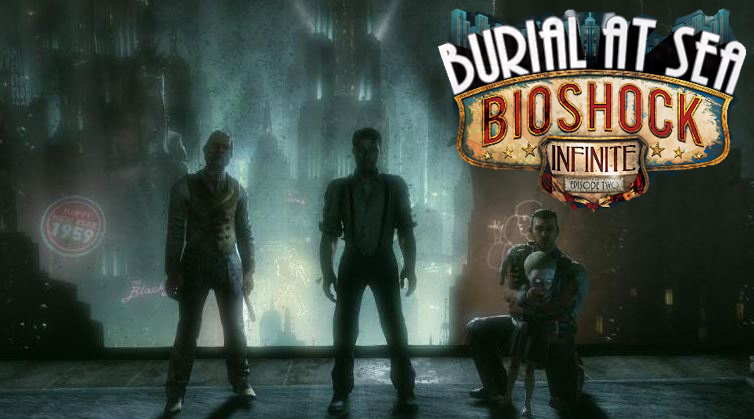 I normally do not write reviews on new releases, but after playing the Burial at Sea Episode 2 DLC for Bioshock: Infinite, I surely found myself looking to write about the favorable experience I had. It is only fair to note, that in order to fully appreciate this review, readers will want to already be familiar with Burial At Sea: Episode 1 and the Bioshock series in general (with less of an emphasis on Bioshock 2). Going further, it should be noted that I did not include any major spoilers in this review. Burial At Sea: Episode 2 takes place immediately after the events of Burial At Sea: Episode 1. As this episode is the last DLC that was supposed to be released for Infinite, it offers a full closing to the Bioshock story, while at the same time serving as a sort-of prequel to the saga. This episode begins by focusing on Elizabeth, the virtually omniscient, time-space warping young woman who Private Investigator, Booker DeWitt, sought to save throughout the events of Bioshock: Infinite. Elizabeth is strolling along the streets of Paris at the turn of the 20th century and being greeted by various admirers and gentleman callers. She begins to follow a little girl named "Sally," and out of nowhere, the dream turns much darker and unpleasant. Elizabeth soon awakens from her nightmare to find herself within Frank Fontaine's Department Store being threatened by Atlas (aka Frank Fontaine) from Bioshock. Atlas is just about ready to kill Elizabeth and Sally (who is now a "Little Sister"), however, an apparition of Booker DeWitt (from inside Elizabeth's thoughts), guides her to respond to Atlas in the correct ways to keep herself alive. Self-preservation is not what drives Elizabeth to work with Atlas, instead, she wishes to fulfill her promise to save Sally from the city of Rapture and keep her safe. Atlas is taking Sally as a hostage until Elizabeth completes all of his tasks and helps him regain access to Rapture. This will be no easy task, as the whole department store is much lower in the ocean than the rest of Rapture is thanks to Andrew Ryan. Throughout this conclusion of the Bioshock series, Elizabeth will have to face up against Andrew Ryan’s henchman, various splicers, and even some guards from the city of Columbia to fulfill Atlas's demands. In fact, in the process of obeying Atlas, Elizabeth will need to find a way to return to Columbia itself. Immediately, players would expect that such tasks would be of ease for someone like Elizabeth. However, when players start to play this DLC, they will realize that Elizabeth no longer has the ability to open “tears” into the fabric of reality. In a praise-worthy context, as players follow the storyline, they will eventually learn why Elizabeth has lost her powers and omniscience. All in all, Elizabeth is now an average individual, only armed with her book-knowledge, amateur combat skills, and a talent for lock-picking (which is now a mini-game similar to the one which is used in Bioshock 2 for hacking). Because of her new vulnerabilities, Elizabeth is now best categorized as a girl struggling for survival in the horrifying world of Rapture. In fact, when playing this episode, I felt like I was playing more of a survival-horror game rather than a first-person-shooter. As opposed to earlier Bioshock titles, the combat in Burial At Sea: Episode 2 is much more stealth-oriented. Elizabeth will mainly have to rely on stealth knock-outs, tranquilizer-darts, noisemakers to distract enemies, and knockout gas. Additionally, two new plasmids, will aid in Elizabeth’s stealth and defense-based combat. For example, one plasmid will allow Elizabeth to convert enemy bullets into ammo for herself, while another will allow her to turn invisible and see enemies through walls. Although stealth is key to surviving in Rapture, Elizabeth will have a small access to various firearms for when there are no opportunities to stay hidden in the shadows. With this new emphasis on subterfuge, I give Burial at Sea: Episode 2 a thumb up. Between the grumblings of schizophrenic splicers, moans of the ocean, and seemingly creepy music played in various areas of the game, the fear factor is certainly amped up. Additionally, because Elizabeth is not the ideal combatant, the likelihood of death is very increased and players can relate to her "normality.". It should be noted, too, that avoiding Big Daddies is a must. These foes cannot be killed, and I felt the sweat trickle down my forehead as I heard one of them moaning and stomping around somewhere nearby. The game almost forces you to look over your shoulder both in-game and in real life, especially when playing at night with surround-sound or while wearing headphones. One thing players will quickly notice are the sound effects which build up as enemies approach Elizabeth or as players move her towards enemies facing the opposite direction. So many times, as I was about to strike an enemy in the back of the head, I could not help but cringe in precaution of the enemy spinning around and scaring the daylight out of me! As usual, the scenery is lovely to look at and the enemy AI’s are fairly sophisticated. I only say "fairly" because, at times, it seems that enemies were able to somehow find me when I was hidden out of sight, in a corner of a room, behind a pile boxes in the shadows. However, at other times, the enemies would somehow miss me run right in front of them! Regardless, one thing is for sure, the best thing to appreciate with this DLC is its sophisticated plot. It ties mainly into the stories of Bioshock: Infinite and the first Bioshock, but if one looks deeply, connections can arguably be made to Bioshock 2 and it’s DLC story, Minerva’s Den. The main gist of Burial At Sea: Episode 2 is coming full-circle with the stories of Rapture and Columbia. Some comparisons and connections are easily identifiable, in which they almost appear with flashing arrows pointing at them. In fact, some connections are established directly by Elizabeth’s own words. On the other hand, some other connections are not so easily established and may even require a second play-through. Rather than Irrational Games spoon-feeding gamers a closure to the story, they give a stealth-based journey which leaves the gamer with a fair sense of wonder. If I had to give the DLC a score, I would give it a 9/10 easily, probably even more as I am admittedly a "Bioshock-fanboy." In my view, by switching up the style of gameplay, this DLC gives players a fresh, horrifying experience, which is comparable to the very first moments of Bioshock. If you are up the challenges, both gameplay-speaking and mentally-speaking, I highly recommend you dive into this DLC.